Happy happy! It is still early in the season but I bet your social calendar is packed, so I am just here to remind you to drink water and maybe grab a vegetable from the crudité platter. Tonight , support some folks who participated in this year’s NaNoWriMo, the month-long exercise in writing #everydamnday during the month of November– also known as National Writing Month. Solid State Books is hosting a DC Public Library celebration reception featuring those who completed 50,000 words in the month of November. Writers will be reading from their work and attendees can enjoy some light fare and learn about published works that began as NaNoWriMo projects. The event is free and begins at 7 p.m.
Friday, the Capitol Riverfront BID hosts the first of three Holiday Movie Nights at The Brig 6:30-10pm. Each evening begins with a half an hour holiday special follwed by a feature length film. This week’s offering are How the Grinch Stole Christmas followed by Home Alone which is only slightly more a Christmas movie than Die Hard. You are free to go ahead and @me but I stand firm in my educated opinion. This Friday features the Ho Ho Happy Hour and patrons are encouraged to bring a toy for a child in need or a coat for the coat drive to extend your happy hour from 7 to 8 p.m.
Wundergarten is hosting holiday pop up markets each weekend of the month featuring local artisans and performances. Friday evening at 6:30 is an LED Light performance piece called Hope Illuminated. Saturday afternoon you can get your photo taken with Santa which will be followed by a holiday cake tasting with Killa Cakes. You can see all of the events here. Want to catch a show staged almost entirely by middle school students? Beauty and the Beast, Jr. plays tonight at 6 p.m. and Saturday at 2 p.m. and 6 p.m. at Stuart Hobson Middle School, 410 E Street NE. More information here. Saturday morning is a Family Pajama Party at the Atlas Performing Arts Center. From 10:30-11:30 will be interactive games and dancing with Elements Dance Company and 11:30-12:30 is arts and crafts in the lobby with a side of milk and cookies. There is spiked hot chocolate for grown ups looking to take the edge off all that holiday joy. Tickets are $16-$20. MORE SANTA: Check out our Santa post so you can keep up with the jolly one. This weekend, East City Books and Coldwell Banker host Santa pop-ups and photo-ops. Remember: Only Capitol Hill Santa is real. A Two Woman Hamlet will play that night at Capitol Hill Arts Workshop. This show had a popular run during the Fringe festival this summer and is back for one night only. Two actors will perform all of Shakespeare’s tragedy. It sounds like fun and they will each get to perform several deaths which must be fun. Tickets are $10 and the performance begins at 7:30p.m. Also on Saturday, there is some little-known tradition called an “Army-Navy game.” Just kidding! Celebrate the tradition that dates back to 1890 at Valor Brewpub and sister restaurant The Ugly Mug, 723 8th Street SE with guest bartenders from both branches of the military. Retired 2nd Lieutenant, Chad Luebbert of the US Army and retired Marine Brigadier General Kevin Nally will be going head-to-head as mixologists. Also of note: The first beers made by Valor’s award-winning Brewmaster and military veteran, Greg Maddrey will be available Saturday! The fun starts at the same time as the game, 3 p.m., and it’ll be first-come, first-served. Finally, it’s Second Saturday at Capitol Hill Books and you know what that means: Free wine and cheese, plus 10% off your purchases, from 4-7 p.m.
Sunday, say goodbye to Special Agent Galactica. She is leaving DC y’all and performing a farewell series of shows at the new performance space above Dangerously Delicious Pies. 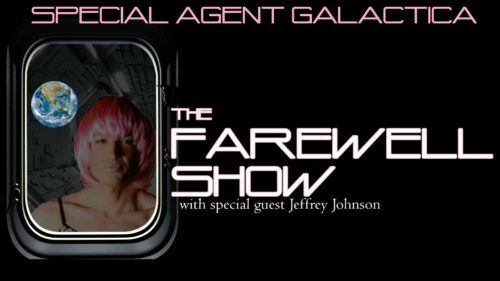 Host and alter ego Jeffery Johnson will kick off three different sets beginning at 5:30 p.m. The evening will also include the show Romp Around Uranus, which she performed at Capital Fringe in 2016 and which included the voice of the B-52’s Fred Schneider. Learn more here. Monday is the annual CHAMPS Sip & Shop and some THIHers will be on hand to say hi. The fun starts at 6 p.m. Come out and support your hardworking small business owners, y’all! Tuesday evening is another offering in the Village Voices lecture series sponsored by the Capitol Hill Village. The evening will feature a lecture on the Universal Declaration of Human Rights by archivist and human rights expert Trudy Peterson. The declaration was signed 70 years ago and boy it sounds so nice right now… the preamble of the Declaration begins by proclaiming that “recognition of the inherent dignity and of the equal and inalienable rights of all members of the human family is the foundation of freedom, justice and peace in the world.” It will begin at 7 p.m. at the NE Library, and is free and open to the public.